Descending monoaminergic inputs markedly influence spinal locomotor circuits, but the functional relationships between specific receptors and the control of walking behavior remain poorly understood. To identify these interactions, we manipulated serotonergic, dopaminergic, and noradrenergic neural pathways pharmacologically during locomotion enabled by electrical spinal cord stimulation in adult spinal rats in vivo. Using advanced neurobiomechanical recordings and multidimensional statistical procedures, we reveal that each monoaminergic receptor modulates a broad but distinct spectrum of kinematic, kinetic, and EMG characteristics, which we expressed into receptor-specific functional maps. We then exploited this catalog of monoaminergic tuning functions to devise optimal pharmacological combinations to encourage locomotion in paralyzed rats. We found that, in most cases, receptor-specific modulatory influences summed near algebraically when stimulating multiple pathways concurrently. Capitalizing on these predictive interactions, we elaborated a multidimensional monoaminergic intervention that restored coordinated hindlimb locomotion with normal levels of weight bearing and partial equilibrium maintenance in spinal rats. These findings provide new perspectives on the functions of and interactions between spinal monoaminergic receptor systems in producing stepping, and define a framework to tailor pharmacotherapies for improving neurological functions after CNS disorders. The modulatory influences of monoaminergic systems are critical for the control of most behaviors in animals and humans. For example, while the spinal neuronal networks that generate locomotor outputs are essentially composed of fast excitatory glutamatergic and inhibitory glycinergic neurons (Grillner, 2006), successful locomotion relies heavily on the coordinated release of serotonin (5-HT), noradrenaline (NA), and dopamine (DA) in various spinal regions (Jordan et al., 2008). Monoaminergic modulation is not restricted to hardwired synaptic communication but also operates perisynaptically through volume transmission (Zoli et al., 1999; Agnati et al., 2010). Monoamines easily escape the synaptic cleft and reach extrasynaptic G-protein-coupled receptors located on neighboring cells (Agnati et al., 2010). This signaling transduction pathway alters cell properties over timescales that span from minutes to hours (Raymond et al., 2001). Thus, volume transmission communication provides a rationale for the powerful role of monoamines in modulating mood, reward, cognitive, and sensorimotor functions (Agnati and Fuxe, 2000), and a conceptual mechanism for some of the therapeutic effects of these pharmacological agents (Zoli et al., 1999). For example, serotonergic pharmacotherapies show a strong potential to facilitate the recovery of locomotion after spinal cord injuries (Chau et al., 1998a; Landry et al., 2006; Courtine et al., 2009). An important issue associated with volume transmission signaling is the need to maintain signal privacy to mediate defined functional modulations while preserving the fundamental features of the behavior (Agnati et al., 2010). Conceptually, neuromodulatory specificity may be obtained if the circuits are endowed with a specific recognition apparatus, such as distinct receptors. Indeed, various monoaminergic receptors show the capacity to modulate behaviors including locomotion (Jordan et al., 2008; Courtine et al., 2009; Guertin, 2009). The ability of monoaminergic pathways to fine-tune distinct functional characteristics of a complex behavior through receptor-specific neuromodulation, however, has not been demonstrated unequivocally. Such functional mapping requires detailed analytic tools and well controlled behavioral outputs to correlate neural receptor activity with specific system-level kinematic features. In this respect, spinal locomotor circuitries offer the key advantage of generating a sophisticated behavior with multifaceted components that can be measured with high precision (Courtine et al., 2009). In particular, epidural electrical stimulation (EES) applied dorsally over specific lumbosacral segments promotes reproducible locomotor patterns that can be recorded in vivo over multiple sessions in adult spinal rats (Lavrov et al., 2008; Courtine et al., 2009). Spinal locomotion retains complex and highly adaptive behavioral features since spinal locomotor networks act as a processing interface that constantly modulates its outputs in response to inputs arising from sensory systems (Courtine et al., 2009). We thus capitalized on the multifaceted and adaptive nature of spinal locomotor outputs to investigate the ability of monoaminergic systems, largely acting via volume transmission, to generate predictable stepping patterns. First, we asked whether 5-HT, NA, and DA receptors could individually tune gait patterns in qualitatively unique ways. Second, we tested the hypothesis that such receptor-specific modulation of stepping behavior may be used to predict interactions resulting from concurrent monoaminergic stimulations. The underlying objective was to define how different receptor systems could be manipulated interactively to control a complicated motor task (i.e., stepping) in paralyzed subjects. The experiments were conducted on 39 adult female Sprague Dawley rats (∼300 g body weight). All procedures and were approved by the Veterinary Office of the Canton of Zurich, Switzerland. Animals were housed individually on a 12 h light/dark cycle, with access to food and water ad libitum. All procedures have been described in detail previously (Courtine et al., 2009). Briefly, under general anesthesia and aseptic conditions, a partial laminectomy was performed over spinal segments L2 and S1. Teflon-coated stainless-steel wires (AS632; Cooner Wire) were passed under the spinous processes and above the dura mater of the remaining vertebrae between the partial laminectomy sites. After removing a small portion (∼1 mm notch) of the Teflon coating to expose the stainless-steel wire on the surface facing the spinal cord, the electrodes were secured at the midline of the spinal cord at spinal levels L2 and S1 by suturing the wire to the dura mater above and below the electrode (see Fig. 1B). A common ground wire (∼1 cm of the Teflon removed at the distal end) was inserted subcutaneously in the midback region. Bipolar intramuscular EMG electrodes using the same wire type as above were inserted bilaterally in the midbelly of the tibialis anterior (TA), midbelly of the vastus lateralis (VL), distal deep compartment of the semitendinosus (St), and medial deep region of the medial gastrocnemius (MG) muscles. All electrode wires were connected to a percutaneous amphenol connector cemented to the skull of the rat. Proper location of the epidural and EMG electrodes was verified postmortem. In the same surgical intervention, the spinal cord was transected completely at a midthoracic level (∼T7) (Courtine et al., 2009). The completeness of spinal cord transections was verified by two surgeons by lifting the cut ends of the cord during the surgery as well as histologically postmortem (Courtine et al., 2009). All tested rats were allowed to recover for 5 weeks after lesion to regain stable levels of excitability in the spinal networks to facilitate locomotion via EES (Lavrov et al., 2008). An upper body harness was used to position the rats over a treadmill belt and to partially support their body weight during bipedal locomotion (see Fig. 1A). An automated, servocontrolled body weight support system (Robomedica) measured and provided the optimal amount of body weight support that each rat needed to step. To facilitate locomotion via EES, monopolar rectangular pulses (0.2 ms duration) were delivered at 40 Hz using two constant-current stimulators (A-M Systems) connected to the electrodes positioned at L2 and S1. The stimulation was delivered between the active electrode (L2 or S1) and an indifferent ground located subcutaneously on the lateral aspect of the body. The frequency and intensity of stimulation was adjusted (40 Hz, 0.2 ms, 50–200 μA) to obtain optimal facilitation of stepping visually. All experimental testing followed the same protocol (see Fig. 1C). We first obtained a robust baseline of locomotor abilities and gait features by recording 10 successive gait cycles during treadmill locomotion (13 cm/s) facilitated by dual-site EES. The effects of individual or combinations of pharmacological agents then were tested. When the effects of pharmacological agents peaked (i.e., ∼15–20 min after injection), a continuous sequence of 10 step cycles were recorded under the same conditions as described above. To identify effective and safe doses to modulate stepping pharmacologically as well as to determine the time course of the drug effects, a first group of rats (n = 14) were treated with various concentrations of selective agonists and antagonists to the different investigated serotonergic, dopaminergic, and noradrenergic receptors. Video recordings of treadmill locomotion were obtained before, and at regular intervals from 10 min up to 2 h after drug injection. These experimental data were used to determine optimal concentrations and time points for the testing of rats in group 2. After completion of preliminary testing with group 1, experimental recordings were conducted in a second group of rats (n = 7) in which the contributions of serotonergic, dopaminergic, and noradrenergic receptors to the modulation of gait patterns were investigated thoroughly. A total of 16 pharmacological agents were evaluated. These rats were tested every other day for ∼4 weeks (31 d), beginning 5 weeks after lesion (see Fig. 1A). Each testing session consisted of a series of 10–20 steps with EES alone followed (10 min later) by a series of 10–20 steps under EES and a given pharmacological agent (see Fig. 1A). Based on previous studies (Courtine et al., 2009), it is unlikely that the limited number of steps performed during each session would have significantly modified the stepping ability of the rats. Rats always were allowed to recover for 1 d after a testing session. The effects of each pharmacological agent were washed out completely after this period of recovery. Testing of agonists and antagonists to the different receptors was randomized across days and rats. On the basis of results from group 2, we next tested the effects of individual or combinations of several agonists or antagonists to serotonergic, dopaminergic, and noradrenergic receptors on the modulation of the stepping patterns (n = 7). Experimental recordings were performed over 2–3 weeks of testing, beginning 5 weeks after lesion (see Fig. 1A). Only one drug or one combination of drugs was tested in each rat on a given day of testing. The different drug combinations were randomized across days and rats. Eight noninjured rats were tested during bipedal locomotion on a treadmill to obtain a representative baseline of stepping characteristics in noninjured subjects. We investigated serotonergic, dopaminergic, and noradrenergic receptors that previously have been shown to be involved in the modulation or production of locomotion in mammals (Chau et al., 1998a; Madriaga et al., 2004; Guertin and Steuer, 2005; Gerasimenko et al., 2007; Lapointe and Guertin, 2008; Courtine et al., 2009; Liu et al., 2009). We also selected agonists and antagonists to the various tested receptors on the basis of those previous studies (see Results). These pharmacological agents present a selective degree of affinity for certain receptor subtypes. When possible, we used combinations of agonists and antagonists to improve the selective activation of a specific receptor (e.g., 5-HT1A and 5-HT7). Nevertheless, the selective activation of a single subtype is difficult to achieve pharmacologically, and this limitation needs to be kept in mind when interpreting the present results. It is worth noting, however, that we obtained a reproducible mapping of receptor-specific locomotor tuning functions in all rats tested, revealing the robustness of the functional link between monoaminergic receptors and gait modulation patterns. Drugs were injected subcutaneously or intraperitoneally (8-OHDPAT). Most antagonistic drugs had no or limited effects on locomotion enabled by EES in spinal rats, as expected based on the complete interruption of descending monoaminergic pathways. To ascertain whether all receptors in the spinal cord were blocked by the injection of each specific antagonist, these studies were followed by the systematic injection of the respective agonist, which in all cases failed to modulate locomotion (data not shown). All combinations of agonists and antagonists were evaluated using concentrations identical with those used for the single drug conditions to avoid uncontrolled interactions associated with the use of different drug concentrations. Three-dimensional video recordings (200 Hz) were made using the motion capture system VICON. Eight infrared television cameras (200 Hz) were used to track the motion of reflective markers attached bilaterally at the iliac crest, greater trochanter, lateral condyle, lateral malleolus, distal end of the fifth metatarsal [metatarsophalangeal joint (MTP)], and tip of the toe (see Fig. 1A). Nexus (Vicon) was used to obtain 3-D coordinates of the markers. The body was modeled as an interconnected chain of rigid segments, and joint angles were generated accordingly. Moments and ground reaction forces in the vertical, anteroposterior, and mediolateral directions were monitored using a biomechanical force plate (2 kHz; HE6X6; AMTI) located below the treadmill belt (see Fig. 1A). Vicon BodyBuilder (Vicon) was used to compute the displacements of the center of foot pressures. EMG signals (2 kHz) were amplified, filtered (10–1000 Hz bandpass), stored, and analyzed off-line to compute the amplitude, duration, and timing of individual bursts (Courtine et al., 2009). Ten successive step cycles were extracted for both the left and right hindlimbs from a continuous sequence of stepping on the treadmill for each rat under each condition. When no stepping movements were observed, a 10 s period was recorded and analyzed. A total of 129 parameters quantifying gait, kinematics, kinetics, and EMG features were computed for each limb and gait cycle according to methods described in detail previously (Courtine et al., 2005, 2008, 2009). These parameters provided a holistic quantification of locomotor patterns ranging from general features of gait to fine details of limb motions and coordination. To allow direct comparisons between the different experimental conditions, all computed variables were normalized to those measured before drug injection (i.e., during locomotion facilitated by dual-site EES alone). The pharmacological agents used in this study promoted substantial modulations of gait patterns, which were evident in the modification of a large proportion of the 129 computed parameters. To evaluate the more important and reproducible modulation patterns mediated by the different drugs across rats, we established a new, multistep statistical procedure based on principal component (PC) analysis (Courtine et al., 2009). The various steps are detailed in Results. PC analysis was applied on data from all individual gait cycles for each rat alone, and for all rats together, as indicated in the text and figures. Data from a single noninjured rat were included in the analysis to avoid overrepresentation of noninjured rats when PC analysis was applied on each rat independently. Because of the high homogeneity among noninjured rats, results were similar regardless of the selected subject, as verified by an iterative bootstrapping algorithm. Data were analyzed using the correlation method, which adjusts the mean of the data to 0 and the SD to 1. This method of normalization allows the comparison of variables with disparate values (large vs small values) as well as different variances. PCs were extracted and a PC score along each axis was computed to quantify differences between conditions. In the vast majority of cases, PC1 differentiated locomotion under EES (baseline) or EES plus antagonist drugs versus locomotion under EES plus agonists to the tested receptor (see Fig. 3). Except for NA2A receptors, PC2 and PC3 were related to idiosyncratic gait features and/or intrinsic variability between steps and, therefore, were not considered for further analysis. The variables that showed the highest factor loading (0.6 or more) on PC1 (i.e., correlation between each variable and the PC that explained the largest percentage of data variance) identified the parameters that accounted for the main effects of the drugs and were used to construct functional maps. We then defined seven categories or locomotor subfunctions to regroup interrelated parameters in functional clusters: locomotion (general facilitation of locomotion), reproducibility, coordination, extension, flexion, forces, and stability. This cluster analysis allowed us to elaborate submaps that highlighted the specifically tuned function and indirectly the extent of this modulation for each receptor. Considering the large number of parameters computed, we only reported those variables that showed the largest factor loadings across all experimental conditions, for both single and combinatory testing (see Fig. 4). In addition, we excluded variables that were redundant (e.g., stride length vs endpoint path length). All data are reported as mean values ± SEM. Repeated-measures ANOVAs were used to test differences between locomotor parameters recorded before and after drug injections. Experiments were conducted on adult rats that received a complete midthoracic (∼T7) spinal cord transection that permanently removed all supraspinal input below the level of the lesion. To reach stable levels of excitability in the spinal networks to facilitate stepping electrically (Lavrov et al., 2006, 2008), the rats were allowed to recover for 5 weeks after lesion before initiating experimental recordings (Fig. 1C). At this time point and during the subsequent 4 weeks after lesion, the rats showed no (Fig. 1D) or limited (Fig. 1E) spontaneous hindlimb stepping when supported in a bipedal posture on a moving treadmill belt (13 cm/s) (Fig. 1A). In contrast, continuous (40 Hz, 0.2 ms, 50–200 μA) EES applied dorsally over the S1 and L2 spinal segments (Fig. 1B) generated continuous hindlimb locomotion on the treadmill in all rats tested (Fig. 1F). Experimental setup and statistical procedures. A, Spinal rats were positioned bipedally in a robotically controlled supporting system. Using reflective markers overlying specific joints (MTP), a force plate located below the treadmill belt, and chronic intramuscular recording electrodes and epidural stimulating electrodes (EES), we measured detailed kinematics, kinetics, and EMG features underlying continuous hindlimb stepping on a treadmill. B, Wires for EES were routed below the spinous processes and sutured over the dura on the dorsal aspect of the L2 and S1 spinal segments. C, Timeline for the entire study and for individual testing sessions. D–F, Representative illustrations of kinematics, kinetics, and EMG features underlying spontaneous and EES-enabled locomotion recorded at 6 weeks after lesion. The same rat is shown in E and F, with and without the presence of dual-site EES. Representative color-coded stick diagram decomposition of hindlimb motion during stance (black), paw dragging (red), and swing (blue) is shown for each condition together with successive (n = 10) trajectories of the limb endpoint (MTP marker). In these drawings, the arrows represent the direction and intensity of limb endpoint velocity at swing onset. A sequence of raw EMG activity from the TA and MG muscles and the changes in vertical ground reaction forces is shown at the bottom. The gray and red boxes indicate the duration of stance and drag phases bilaterally, while open areas indicate the duration of the swing phase. Averaged (n = 10 steps) rectified EMG activity, vertical forces, and stance period durations are displayed nearby the raw data in the rightmost plots. G, Multistep statistical procedures to extract intervention-specific parameters. Step 1, Quantification of kinematics, kinetics, and EMG features (129 variables measured) for each rat. Step 2, PC analysis was applied on each rat independently (all sessions) or on all rats and sessions simultaneously. Bar graphs indicate the amount of variance explained by each PC for individual (top; means + SEM) and collective (bottom) PC analyses. Step 3, Three-dimensional, PC-based statistical representation of spontaneous locomotion and EES-enabled stepping recorded in all rats (n = 7) during several recording sessions (5–8 weeks). Each point represents a single gait cycle from an individual rat under a given condition (total gait cycles, 979). In this representation, the discrepancy between locomotor features increases with the distance between data points, and inversely, data points indicating similar gait patterns are in close proximity. In the bottom plot, least-squares spheres are traced for each condition to emphasize the clear differences between statistically extracted gait patterns under specific interventions. The bar graph shows the average (n = 7 rats) scores along PC1, which correspond to the coordinates of data points along the axis that accounted for the largest amount of the total variance. These scores indicate the degree of difference versus similarity between conditions. Step 4, Color-coded representation of factor loadings (i.e., correlation values between each variable) and PC1 that identify the variables that contribute most to the differences observed between the experimental conditions. PC2 and PC3, instead, were related to idiosyncratic gait features, varied locomotor performances, and step-to-step variability. Factor loadings extracted for each rat independently are represented in successive columns. The last column shows averaged factor loadings and thus identifies parameters modulated consistently across rats (i.e., the most relevant variables). Interrelated parameters can then be regrouped into functional clusters (see Materials and Methods). Step 5, Bar graphs of mean (n = 7 rats) values for the most relevant variables identified in step 4. BWS, Body weight support. Error bars indicate SEM. The asterisks indicate significantly different at **p < 0.01 and ***p < 0.005, respectively. We quantified specific modulations of stepping patterns mediated by EES compared with spontaneous locomotion using a new five-step statistical analysis based on PC analysis (Fig. 1G). A total of 129 parameters providing detailed quantification of kinematics, kinetics, and EMG features underlying hindlimb stepping patterns for each rat were determined (Courtine et al., 2009). PC analysis was applied on all computed parameters both for individual rats and for all rats combined. This analysis constructs new variables (PC) that linearly combine the original variables to maximize the amount of explained variance for each successive PC. When gait cycles are visualized in the 3-D space defined by the newly constructed variables PC1–3 (37% of explained variance) (Fig. 1G, step 2), clear differences emerged between the spontaneous and EES conditions (all rats and sessions) (Fig. 1G, step 3). EES-related data points clustered in a well defined location that highlighted the reproducibility of electrically facilitated locomotor patterns across steps, between days of testing (5–8 weeks), and among rats (n = 7). In contrast, the distribution of data points related to spontaneous locomotion illustrated the wide range of movements observed under this condition [i.e., from complete paralysis (Fig. 1D) to occasional plantar stepping (Fig. 1E)]. For individual rats, we computed correlations (factor loadings) between each measured parameter and PC1 that accounted for the largest part of the variance (39 ± 9%), thus reflecting EES-related modulations. In contrast, PC2 and PC3 were related to differences in stepping performances between rats and step-to-step variability. We then visualized these results in color-coded tuning maps (Fig. 1G, step 4). Although a large number of parameters were modulated significantly with EES-facilitated locomotion compared with spontaneous stepping for each rat (p < 0.05) (Fig. 1G, step 4, colored areas), only a few variables consistently changed in the same direction across all rats (Fig. 1G, step 4, last column). These statistically extracted variables then were regrouped into functional clusters (Fig. 1G, step 4, rightward table) that highlight the locomotor subfunctions specifically modulated in all rats with the EES intervention, regardless of idiosyncratic gait characteristics or baseline stepping abilities. We defined seven locomotor subfunctions: locomotion (general facilitation of stepping), reproducibility, extension, flexion, coordination, forces, and stability. The variables associated with the identified functional clusters were represented to illustrate the amplitude of the tuning (Fig. 1G, step 5). This analysis showed that, compared with spontaneous locomotion, EES improved extension, flexion, coordination, reproducibility, and forces. The tuning of these locomotor subfunctions is illustrated by the larger EMG activity in distal extensor and flexor muscles, increased vertical ground reaction forces, enhanced step height, increased reproducibility of limb endpoint trajectory, and improved interlimb coordination. We then used these same analyses to identify specific functional links between monoaminergic receptor systems and gait pattern modulations in spinal rats receiving EES to facilitate stepping. 5-HT1A (Courtine et al., 2009), 5-HT2A/2C (Courtine et al., 2009), 5-HT3 (Guertin and Steuer, 2005), and 5-HT7 (Liu et al., 2009) receptors have been the main 5-HT receptors studied in the modulation and/or production of locomotion in rodents (Jordan et al., 2008). To evaluate their specific functions, we manipulated these neural pathways pharmacologically using specific agonists and antagonists to these receptors at optimal concentrations. All functional evaluations were conducted in the presence of EES. Although antagonists to 5-HT receptors occasionally modified EES-induced locomotion (data not shown), no reproducible effects could be detected across rats (all rats and step cycles) (see Fig. 3A–D). 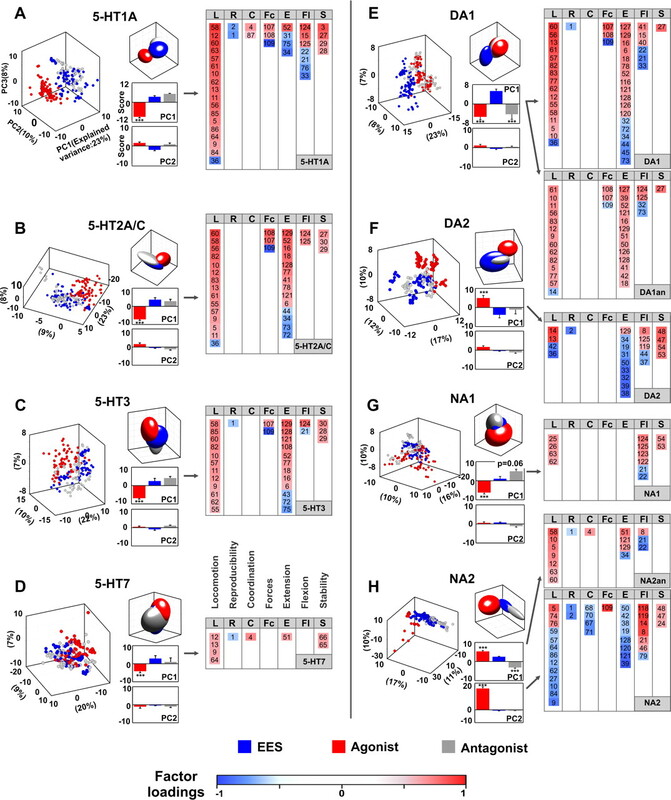 In contrast, stimulation of 5-HT1A, 5-HT2A/2C, 5-HT3, or 5-HT7 receptors each mediated significant and specific changes in the stepping patterns (p < 0.005) (Fig. 3A–D). In rats pretreated with the 5-HT7 antagonist SB269970 [(R)-3-[2-[2-(4-methylpiperidin-1-yl)ethyl]pyrrolidine-1-sulfonyl]phenolhydrochloride] (5–7 mg/kg) (see Materials and Methods), administration of the 5-HT1A/7 agonist 8-OHDPAT (0.05 mg/kg) markedly modulated the stepping patterns enabled by EES (Figs. 2A,B, 3A). This tuning was characterized by improved interlimb coordination (Fig. 4A2), reduced kinematic variability (Fig. 4A4,C4), increased weight-bearing capacities (Fig. 4C2) and ground reaction forces (Fig. 4C1), and a general facilitation of locomotion and flexion (Fig. 3A). This latter influence was evident in the increased flexion at all joints (Fig. 5A), reduced paw dragging (Fig. 4A6), and increased activity of flexor muscles compared with EES alone (Fig. 4B3). Receptor-specific modulation of stepping patterns enabled by EES in spinal rats. Representative characteristics of stepping patterns recorded during EES alone (A), and after the administration of agonists or antagonists to specific 5-HT, DA, and NA receptor subtypes, as indicated above each panel (B–K). Conventions are the same as in Figure 1. The same rat is shown in all panels. Statistical representation of receptor-specific modulation of stepping patterns. A–H, For each monoaminergic receptor system independently, PC analysis was applied on all gait cycles recorded from all rats (n = 7) under EES alone, under EES and a given agonist, and under EES and the respective antagonist. Representations and conventions are the same as in Figure 1. Each 3-D plot has been rotated to adequately visualize discrepancies between the locations of gait cycles associated with the different experimental conditions. Each point represents a gait cycle under a given condition. Data points clustered in distinct spatial locations, revealing that pharmacological interventions modulated locomotor patterns in the same direction in all the rats, regardless of the initial stepping performance or idiosyncratic gait features. The bar graphs show average (n = 7 rats) scores along PC1 and PC2. 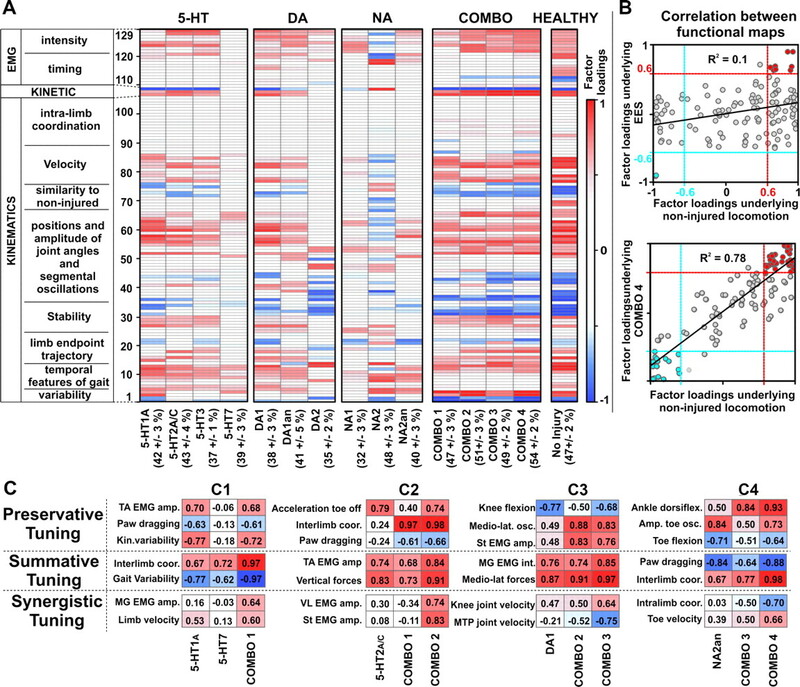 PC1 captures the main effects of the drugs, whereas PC2 (not significant, except for NA2) and PC3 (data not shown) are related to differences between rats' performances and step-to-step variability. Next to each plot, we regrouped parameters with factor loadings superior to 0.6 into functional clusters or locomotor subfunctions: generation facilitation of locomotion (L), reproducibility (R), coordination (C), forces (Fc), extension (E), flexion (F), and stability (S). The number of variables represented in each cluster and the intensity of the color indicate, for each monoaminergic receptor, the specifically tuned locomotor subfunctions and the amplitude of this modulation. Error bars indicate SEM. The asterisks indicate significantly different (***p < 0.005) from all other nonmarked conditions. Selected kinematics, kinetics, and EMG features of locomotor patterns. Bar graphs of average values (n = 7 rats, 10 steps from the right limb per rat) for selected kinematics (as indicated above each panel A1–A8), (A), EMG (as indicated above each panel B1–B4), and stability (kinetics and kinematics) (as indicated above each panelC1–C4) parameters that were more frequently identified as relevant variables by PC analysis to account for receptor-specific gait pattern modulations. These variables were obtained by averaging factor loadings across all experimental conditions and sorting those parameters with the largest values. However, redundant or similar variables were excluded. With the exception of interlimb coordination (A2), all values were normalized to the mean values recorded for each rat during stepping facilitated by EES alone on the same day of testing (horizontal gray dotted line). The solid line in A2 represents the value (−0.5) underlying a perfect alternated (out-of-phase) coupling between the left and right hindlimbs. For each parameter, the actual mean value for all sessions and rats is reported within the box attached to the right aspect of the baseline. Data from noninjured rats were normalized to the grand average of values recorded during stepping with EES in all rats for all recording sessions. For weight-bearing levels, a value of 50% corresponds to full weight-bearing hindlimb locomotion, as recorded in noninjured rats walking in a bipedal posture. Combo 1, 5-HT1A plus 5-HT7. Combo 2, 5-HT1A plus 5-HT7 plus 5-HT2A/C. Combo 3, 5-HT1A plus 5-HT7 plus 5-HT2A/C plus DA1. Combo 4, 5-HT1A plus 5-HT7 plus 5-HT2A/C plus DA1 plus NA2an. Error bars indicate SEM. The asterisks indicate significantly different from EES baseline at *p < 0.05, **p < 0.01, and ***p < 0.005, respectively. Functional maps underlying gait pattern modulations mediated by monoaminergic interventions. A, Color-coded representation of factor loadings associated with PC1 (i.e., correlations between the different variables and the component that accounted for 30–50% of the total variance), as reported below each column as the mean ± SEM. Factor loadings were computed in each rat independently, averaged across rats (n = 7 rats), and represented as a mean for each receptor and each combinatorial intervention in the successive columns. The last column shows averaged factor loadings obtained for noninjured (healthy) rats (n = 8 rats). B, Correlation between factor loadings underlying locomotion of noninjured rats (n = 8 rats), stepping enabled by EES in spinal rats (left) or by EES and the full monoaminergic combinatorial intervention (combo 4; right). Regression lines and values of regression coefficients are reported in the respective graphs. C1–C4, Selected details of functional maps represented in A. Submaps were chosen to illustrate the three main tuning schemes underlying the modulation of stepping patterns under the combined interventions (i.e., preservative, summative, and synergistic tuning), which are ordered vertically. The actual value for each factor loading and condition is reported in the corresponding colored box. Amp., Amplitude; Kin., kinematics; coor., coordination; osc., oscillation; int., integral. Activation of 5-HT2A/C receptors with quipazine (0.2 mg/kg) resulted in a clear facilitation of extension, particularly in distal joints (Figs. 2C, 5A). Stance duration became longer (Fig. 4A1), the duration (Fig. 4B2) and amplitude (Fig. 4B4) of EMG bursts in distal extensor muscles increased significantly, and improved weight-bearing ability (Fig. 4C2) accompanied a threefold increase in vertical ground reaction forces (Fig. 4C1). A significant facilitation of flexor motor pools also was observed (Fig. 4B3). Thus, 5-HT2A/C receptors essentially facilitated weight-bearing and extension components (Fig. 3B). The 5-HT2A/C antagonist ketanserin [3-(2-[4-(4-fluorobenzoyl)-1-piperidinyl]ethyl)-2,4(1H,3H)-quinazolinedione (+)-tartrate salt] (2–4 mg/kg) had no systematic effects on locomotion enabled by EES. Most of the locomotor features that clustered on PC1 with the activation of 5-HT2A/C receptors were also found when the 5-HT3 agonist SR 57227A [4-amino-1-(6-chloro-2-pyridyl)-piperidine hydrochloride] (1.5 mg/kg) was administered (Figs. 2D, 3C). In addition to markedly enhancing the extension components (Fig. 4B4,C1,C2) and weight-bearing features (Fig. 4C1,C2), activation of 5-HT3 receptors significantly reduced gait timing variability and paw dragging (Fig. 4A6). Moreover, the increase in the duration of EMG bursts in distal extensor muscles, which also was observed with the activation of 5-HT2A/C receptors, was particularly prominent when stimulating 5-HT3 receptors (Figs. 2D, 4B2). The 5-HT3 antagonist ondansetron [1,2,3,9-tetrahydro-9-methyl-3-[(2-methyl-1H-imidazol-1-y1)methyl]-4H-carbazol-4-one hydrochloride] (3–5 mg/kg) had no systematic effects on locomotion enabled by EES (Fig. 3C). When the 5-HT1A antagonist WAY 100.635 [N-[2-[4-(2-methoxyphenyl)-1-piperazinyl]ethyl]-N-(2-pyridyl)cyclohexanecarboxamide] (0.5 mg/kg) was administered before 8-OHDPAT to activate 5-HT7 receptors, limited changes in stepping patterns were detected (Figs. 2E, 3D). The few variables that clustered on PC1 essentially were related to improved rhythmicity and coordination (Figs. 3D, 4A2,A8). The moderate affinity of 8-OHDPAT for 5-HT7 receptors, however, may have accounted for these unexpectedly weak effects of activating 5-HT7 receptors (Liu et al., 2009). Dopamine exerts potent facilitating effects on locomotion of spinal mice through DA1-like receptors (Lapointe et al., 2009). In vitro experiments in neonate mice also suggested a role for DA2-like receptors (Madriaga et al., 2004), which, however, could not be confirmed in adult spinal animals in vivo (Lapointe et al., 2009). We investigated the specific influences of the activation of these receptors on locomotor behavior. Activation of DA1-like receptors with R-(+)- 6-chloro-7,8-dihydroxy-1-phenyl-2,3,4,5-tetrahydro-1H-3-benzazepine hydrobromide (SKF-81297) (0.15–0.2 mg/kg) markedly enhanced motoneuronal drive in both extensor and flexor muscles concomitantly with pronounced changes in hindlimb kinematics during both stance and swing (Fig. 2F). The durations of the stance phase (Fig. 4A1) and of extensor EMG bursts (Fig. 4B2) were longer and the vertical ground reaction forces were twofold to threefold higher compared with locomotion enabled by EES alone (Fig. 4C1). During swing, the amplitude of limb oscillations (stride length) markedly increased (Fig. 4A8), and this was associated with larger limb endpoint velocities (Fig. 4A7), higher foot elevations (Fig. 4A5), and reduced paw dragging (Fig. 4A6). This widespread but rather unspecific facilitation of locomotion with a bias toward extension is well illustrated in the distribution of the modulated variables in each functional cluster associated with DA1 receptors (Fig. 3E). At an optimal concentration (0.1–0.15 mg/kg), the selective DA1 antagonist R-(+)-7-chloro-8-hydroxy-3-methyl-1-phenyl-2,3,4,5-tetrahydro-1H-3-benzazepine hydrochloride (SCH-23390) modulated the stepping patterns in a strikingly similar way as DA1 agonists (compare Fig. 2F,G, as well as 3-D plot and functional clusters in Fig. 3E). Although PC analysis identified subtle differences between the two interventions (Figs. 5A, 6A), the modulated parameters and the extent of this tuning were remarkably similar when agonists or antagonists to DA1-like receptors were administered (Fig. 4A–C). Similar, agonist-like effects of the DA1 receptor antagonist SCH-23390 have previously been reported in rats (Wachtel and White, 1995). Interactive monoaminergic strategies mediate unique in vivo functional states of the spinal circuitry. A, Three-dimensional representation of stepping patterns recorded during locomotion facilitated by EES alone (1) and in conjunction with the monoaminergic receptors investigated (2–10) for a representative spinal rat. Conventions are the same as in Figure 1. Each experimental condition is color-coded and identified by a number that is reported in the nearby legend. B, Three-dimensional representation of stepping patterns recorded during locomotion facilitated by EES alone (1) and various combinations of monoaminergic agents (2–10) for a representative spinal rat. Data from a noninjured rat also are reported (11). C, Quantification of the relative capacities of individual pharmacological interventions and their combinations to modulate locomotion enabled by EES. This capacity was evaluated for each rat independently (n = 7 rats) as the 3-D distance between the EES condition and each monoaminergic intervention in the space created by PC1–3 when applying PC analysis on all conditions simultaneously. The color coding used in A and B has been implemented to differentiate the experimental conditions. The DA2 antagonist eticlopride (0.9–1.8 mg/kg) had no systematic effects on locomotion enabled by EES (Fig. 3F). In contrast to previous behavioral observation in spinal mice (Lapointe et al., 2009), we found significant (p < 0.001) (Fig. 3F) changes in gait patterns following administration of the D2-like agonist quinpirole (0.15–0.2 mg/kg) (Fig. 2H). This pharmacological agent resulted in a clear facilitation of flexion and improved gait consistency but also led to a markedly reduced hindlimb extension (Fig. 3F). Activation of DA2-like receptors increased the durations of the swing phase (Fig. 4A3) and of the EMG bursts in flexor muscles (Fig. 4B1). In addition, DA2 agonists reduced the variability of joint angle kinematics (Fig. 4B4) and resulted in improved consistency of limb endpoint trajectories (Fig. 4C4). While previous studies have reported a limited ability of α1 adrenergic receptors (NA1) to trigger locomotion (Chau et al., 1998b), marked facilitation of locomotion by the α2 adrenergic (NA2) agonist clonidine has been demonstrated repeatedly in spinal cats (Grillner and Zangger, 1979; Chau et al., 1998b). The NA1 agonist methoxamine (2–2.5 mg/kg) produced limited and variable changes in the stepping patterns of spinal rats, although some variables, essentially associated with flexion, consistently clustered in PC1 (p < 0.05) (Figs. 2I, 3G). Activation of the NA1 receptor mediated a decrease in paw dragging duration (Fig. 4A6) that was associated with an increased EMG activity in distal flexor muscles (Fig. 4B3). The NA1 antagonist prazosin (3 mg/kg) somewhat altered gait in a few rats but failed to mediate any significant modulations (Fig. 3G). In sharp contrast with an enhancement of stepping ability in spinal cats, the NA2 agonist clonidine (0.4–0.5 mg/kg) abolished the stepping enabled by EES in spinal rats. Activation of the NA2 receptor transformed continuous patterns of locomotion into gait patterns ranging from hopping (n = 3) (Fig. 2J) to complete paralysis (n = 4). Clonidine also decreased the duration (Fig. 4B1) and amplitude (p < 0.05) (Fig. 4B3) of flexor EMG bursts and changed rhythmic firing patterns of extensor motor pools toward more tonic patterns of activity (Fig. 4B2). As a consequence, a large number of gait parameters changed significantly (Fig. 3H), generally showing a suppression of locomotor function after administering clonidine in spinal rats (Fig. 4A–C). Low clonidine dosages were also shown to suppress or markedly reduce locomotor EMG activity in humans with a severe spinal cord injury (Dietz et al., 1995). The NA2 antagonist yohimbine (0.4–0.5 mg/kg) conversely improved locomotion (Fig. 2K), modulating various parameters in opposite directions compared with clonidine (PC1; p < 0.001) (Fig. 3H). Blocking NA2 receptors reduced paw dragging (Fig. 4A6) and substantially improved the consistency of limb endpoint trajectories (Fig. 4C4) and interlimb coordination (Fig. 4A2). Moreover, compared with locomotion enabled by EES, distal extensor muscle EMG bursts increased in amplitude (Fig. 4B4) and duration (Fig. 4B2). Thus, cluster analysis showed that NA2 antagonists principally improved the reproducibility of stepping movements and some aspects of hindlimb extension. 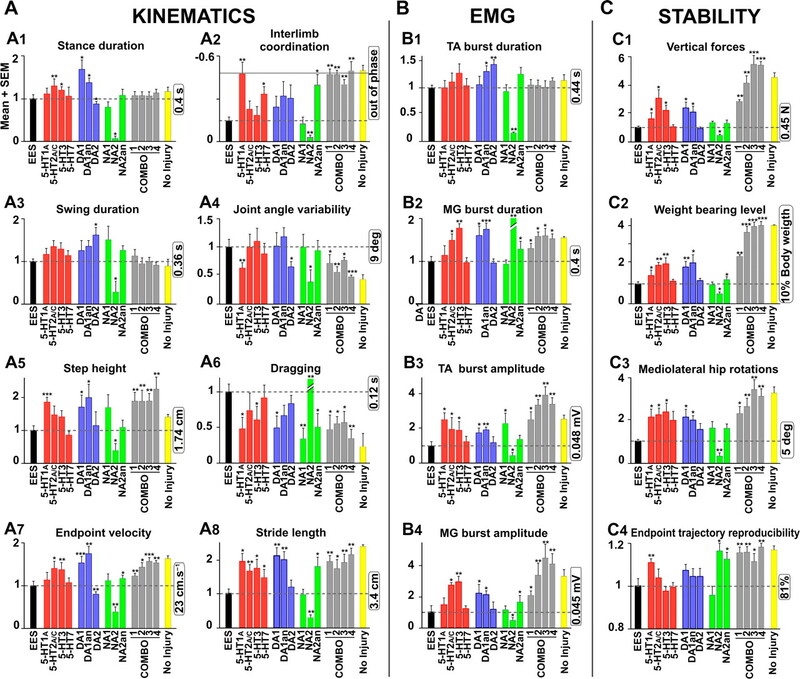 The above results demonstrate that each of the monoaminergic receptors investigated could mediate specific and reproducible changes in kinematics, kinetics, and/or EMG features during locomotion enabled by EES in adult spinal rats, regardless of the idiosyncratic gait characteristics exhibited by each subject (Fig. 3A–H). These complex fine-tuning patterns could be visualized in holistic functional maps that highlighted both receptor-wide adjusted parameters and receptor-specific modulations of locomotor subfunctions (Figs. 3A–H, 5A). To firmly establish the ability of each receptor to modulate gait in unique ways, we applied PC analysis on all gait cycles from all conditions simultaneously. When plotted in the 3-D space created by PC1–3 (47 ± 3% of the explained variance), each experimental condition emerged in clearly distinct spatial locations (p < 0.05) (Fig. 6A), confirming that each of the 5-HT, DA, and NA neural pathways tested promoted unique stepping behavior when combined with EES in rats deprived of supraspinal input. In this representation, the spatial distance between data points is proportional to the degree of difference between gait patterns: consequently, the stronger the ability of a given receptor to modulate electrically enabled stepping (Fig. 6C), the larger the distance between data points associated with that specific condition compared with those related to locomotion with EES alone (Fig. 6A). Moreover, the preferential modulation of extension by 5-HT2A/C, 5-HT3, DA1, and DA1 antagonist (DA1an) versus flexion and/or rhythm by 5-HT1A, 5-HT7, and DA2 is reflected in their respective spatial locations (Fig. 6A). We next investigated the functional tuning of gait patterns when manipulating multiple monoaminergic receptor systems simultaneously. Specifically, we sought to define useful functional principles that might predict interactions between 5-HT, DA, and NA neural pathways with the aim of tailoring effective monoaminergic mixtures to promote successful stepping behaviors in spinal rats. For this purpose, we selected pharmacological agents that showed potent modulating effects (Fig. 6C) together with the highest degree of specificity (Fig. 5A). To avoid confounding factors related to different drug–drug interactions with changing concentrations, these experiments were performed using the optimal dosages identified with stimulation of single pathways. These combinatorial studies were conducted with a second group of spinal rats (n = 7) that received no exposure to treadmill locomotion (no step training) until experimental testing (i.e., at 5 weeks after spinal cord transection) (Fig. 1A). We first established that activation of 5-HT1A and 5-HT7 receptors with 8-OHDPAT improved the stepping patterns compared with activation of either receptor alone (p < 0.01) (Figs. 6B, 7A,B). Under combinatorial interventions, modulation of the original receptor-specific functional maps (Fig. 5A) could be differentiated along three novel tuning schemes. (1) Preservative tuning characterized sets of parameters that were equally modulated when activating single versus multiple receptors (Fig. 5C1). For example, reduction of the duration of dragging (Fig. 4A6) and increase in EMG activity of distal flexor muscles (Fig. 4B3) mediated by 5-HT1A activation also were observed with additional stimulation of 5-HT7 receptors, with the magnitude of these modulations being similar under both conditions. (2) Summative tuning defined variables independently modulated by 5-HT1A and 5-HT7, but whose amplitude of tuning increased during a combined intervention, as exemplified by interlimb coordination (Fig. 5C1) and gait timing variability (Fig. 5C1). (3) Synergistic tuning described variables that showed no or weak changes during activation of single receptors but became consistently modulated when multiple receptors were activated concurrently. For instance, limb endpoint velocity (Fig. 5C1) and EMG activity of distal extensor muscles (Fig. 5C1) reached significantly (p < 0.05) increased levels compared with locomotion enabled by EES (Fig. 4A7,B4) only under combined 5-HT1A and 5-HT7 activation. The concurrent manipulation of multiple monoaminergic pathways powerfully modulates stepping patterns. 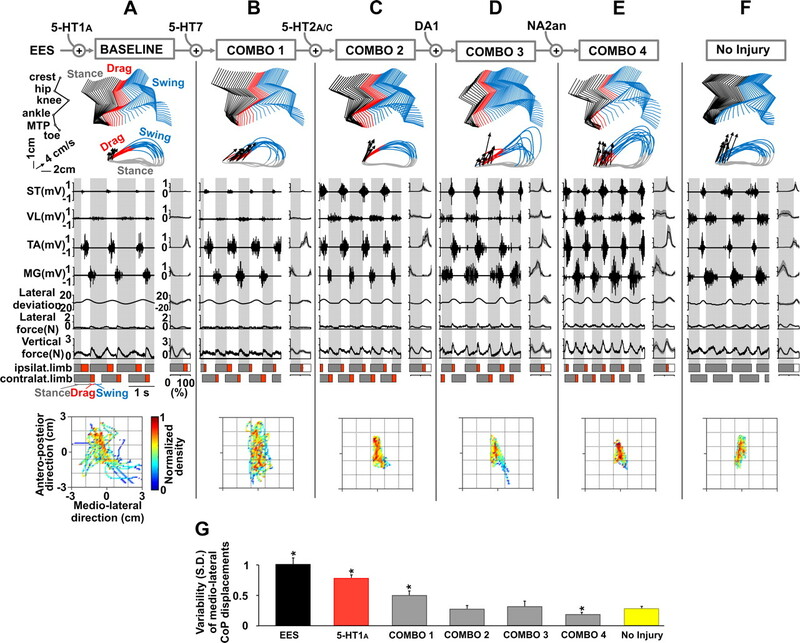 Representative features of gait patterns recorded during locomotion enabled by EES and modulated by increasingly complex combinations of agonists and antagonists to 5-HT, DA, and NA receptor subtypes are shown. A–F, From left to right, the successive panels show locomotor features resulting from manipulating one additional monoaminergic pathway compared with the previous panel as indicated above each panel. In addition to parameters detailed in Figure 1, EMG activity from proximal extensor (VL) and flexor (St) muscles and changes in whole-limb oscillations and ground reaction forces in the mediolateral direction are displayed. The entire limb is defined as the virtual segment connecting the crest to the MTP marker. At the bottom, plots show the density distribution of CoP displacements in anteroposterior and mediolateral directions for each experimental condition. Values are centered (0, 0) on the average position of the pelvis over the duration of the stance phase. The same spinal rat is shown in all the panels, except for the rightmost representation that shows data from a noninjured rat for comparison. G, Bar graphs of average values (n = 7 rats, 10 steps from the right limb per rat) for the SD of CoP displacements in the mediolateral direction during stance of the right limb. Error bars indicate SEM. The asterisk indicates significantly different from all the other conditions at *p < 0.05. Based upon the potent facilitation of flexion and rhythmicity but the weak influence on extension with activation of 5-HT1A and 5-HT7 receptors, we next sought to enhance extension and weight-bearing capabilities by additionally activating 5-HT2A/C receptors with quipazine (Fig. 7C). The modulating specificity of each serotonergic pathway was well preserved with this combined activation: this preservative tuning (Fig. 5C2) was evident in the improved interlimb coordination (Figs. 4A2, 5C2) and reduced duration of dragging (Figs. 4A6, 5C2) mediated by activation of 5-HT1A/7 receptors as opposed to the acceleration of the limb endpoint at push-off (Fig. 5C2) resulting from stimulation of 5-HT2A/C receptors. Moreover, summative tuning (Fig. 5C2) of components such as ground reaction forces (Figs. 4C1, 5C2) and distal flexor activity (Figs. 4B3, 5C2) allowed spinal rats to locomote continuously on the treadmill with substantial weight bearing (Fig. 4C2) and to have highly reproducible limb endpoint trajectories during swing (Fig. 4C4). Simultaneous activation of 5-HT1A, 5-HT7, and 5-HT2A/C receptors also mediated a significant increase in the EMG activity of proximal extensor and flexor muscles compared with stepping enabled by EES alone, a synergistic tuning that consistently occurred with this combination (Figs. 5C2, 7C). Moreover, combo 2 mediated marked changes in parameters related to the dynamic control of balance. This combinatorial intervention allowed the spinal rats to regain the capacity to firmly stabilize their hindlimbs in the mediolateral direction during stance (Fig. 7C), and subsequently to perform a swift abduction–adduction limb movement during swing to position the foot within the base of support at the time of paw contact (Fig. 7C). This pattern of movement resulted in sizeable ground reaction forces in the mediolateral direction (Fig. 7C) that were associated with a significant (p < 0.01) (Fig. 7G) reduction in the center of foot pressure (CoP) displacements in the mediolateral direction. Together, these results indicate that combo 2 mediated improved functional states of the spinal circuitry compared with combo 1 (p < 0.01). With the next objective being to reach higher levels of weight bearing, we added the DA1 agonist SKF-81297, which strongly increased both extensor and flexor motoneuronal drives when administered individually (Fig. 2F). Combined with 5-HT1A/7 and 5-HT2A/C agonists, additional activation of DA1 receptors significantly increased vertical (p < 0.05) (Fig. 4C1) and mediolateral (p < 0.05) (Fig. 4B3) forces as well as the amount of weight bearing (p < 0.05) (Fig. 4C2). This increase in the overall output of the locomotor circuitries, however, occasionally resulted in short sequences of steps during which limb trajectories and interlimb coordination became more variable (Fig. 7D). Therefore, whereas weight-bearing capabilities were higher with combo 3, locomotor states induced by combo 2 exhibited more stable stepping patterns. To improve the performance observed during combo 3-mediated locomotor states, we next selected the NA2 antagonist yohimbine because it showed the specific ability to reduce joint angle variability, improve limb endpoint consistency, and enhance interlimb coordination (Fig. 2K). In combination with 5-HT and DA agonists, the stabilizing effects mediated by yohimbine were even more evident than during locomotion enabled by EES alone (Fig. 7E). Compared with combo 3, the additional blocking of NA2 receptors significantly reduced the variability of the hindlimb kinematics (p < 0.01) (Fig. 4A4,C4) and further improved the stability of stepping patterns including balance-related components (Fig. 7G) and fine movements of the distal extremities (p < 0.01) (Fig. 5C4). Compared with the other combos, locomotor states mediated by combo 4 promoted stepping patterns that showed the largest degree of similarities with characteristics underlying bipedal locomotion of non-disabled rats (Figs. 5C, 7E,F). 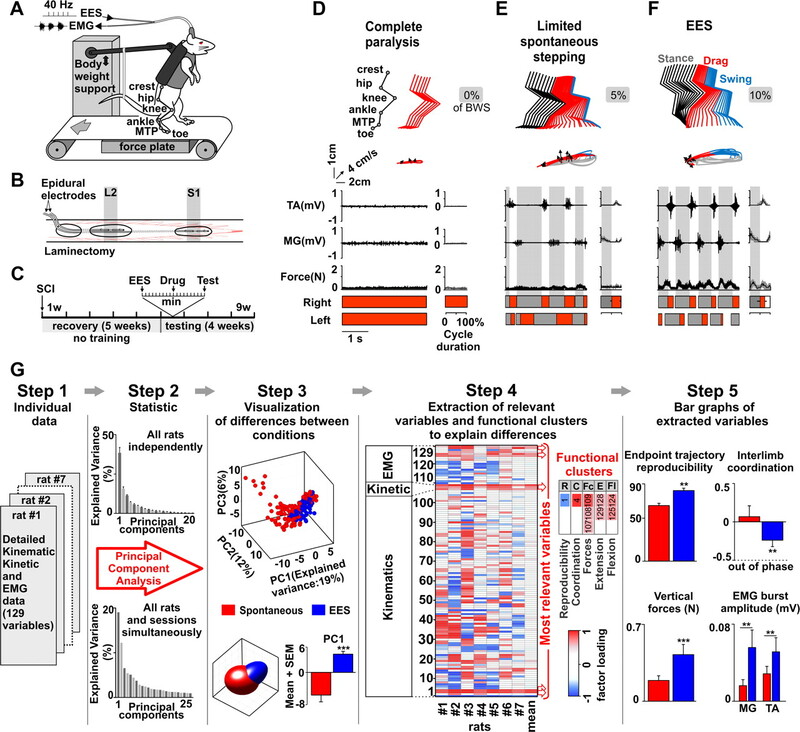 These results demonstrate that our detailed functional mapping of 5-HT, DA, and NA receptor functions can be readily exploited to tailor interactive monoaminergic strategies to mediate specific functional states (i.e., stepping behaviors), including highly successful locomotion on a treadmill in rats with complete spinal cord injury (see Notes). Statistical representations of pharmacologically mediated modulations highlight the progressive convergence of gait patterns (Fig. 6B) and functional tuning maps (Fig. 5A) toward those of non-disabled rats with the manipulation of an increasing number of specific monoaminergic pathways. Although differences persisted between gait patterns of spinal versus noninjured rats (Fig. 6B), functional maps associated with locomotion enabled by EES plus the full combinatorial monoaminergic approach (combo 4) strongly correlated with those underlying stepping patterns of noninjured rats (Fig. 5C). We demonstrate that serotonergic, dopaminergic, and noradrenergic receptors can be modulated pharmacologically to tune specific features of gait in adult spinal rats. Using this catalog of monoaminergic tuning functions, we could predict optimal pharmacological combinations that enabled a range of locomotor states including coordinated locomotion with normal levels of weight bearing and partial equilibrium maintenance in paralyzed rats. To mediate specific functional influences through monoaminergic pathways, the targeted neuronal circuits must be equipped with a distinct recognition apparatus (Agnati et al., 2010). While this conceptual view predicts distinct relationships between monoaminergic receptors and gait modulations, previous studies provided limited information regarding the specific level of tuning that can be mediated with monoaminergic stimulations (Chau et al., 1998b; Liu and Jordan, 2005; Landry et al., 2006; Lapointe and Guertin, 2008). In this investigation, we obtained detailed functional recordings and implemented sophisticated statistical procedures to quantify the neurobiomechanical events underlying well controlled stepping behaviors in vivo in response to the activation or inhibition of a range of serotonergic, dopaminergic, and noradrenergic receptors. This systematic and comprehensive approach allowed us to establish robust relationships between monoaminergic pathways and the modulation of specific locomotor subfunctions. The schematic representation in Figure 8A illustrates the relative ability of each serotonergic, dopaminergic, and noradrenergic receptors to modulate gait features toward those underlying locomotion of healthy rats. 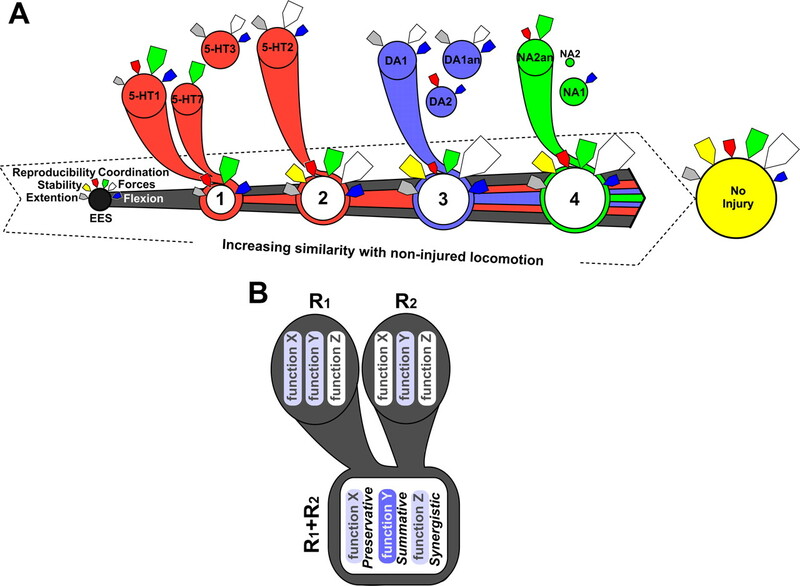 Schematic summary of specific monoaminergic tuning functions and interactions between monoaminergic receptor systems in modulating locomotion of spinal rats. A, Representation of receptor-specific tuning function and their interactions. The size of each circle is proportional to the respective ability of each serotonergic, dopaminergic, and noradrenergic receptor subtype to modulate gait features toward those underlying locomotion of healthy rats (rightmost circle). Since many of the computed kinematic, kinetic, and EMG parameters were associated with similar aspects of locomotion, we regrouped interrelated gait features under a common label or subfunction. We thus distinguished six locomotor subfunctions: reproducibility, extension, flexion, coordination, forces, and stability, as shown for the cluster analysis (Fig. 3). The presence and size of the color-coded arrows around each studied receptor, respectively, indicate the modulation of the related subfunction and the amplitude of this tuning. Combinations 1–4 correspond to the combinatorial monoaminergic interventions (combos 1–4) described in Figure 7. This schematic representation highlights that each of the investigated monoaminergic pathways show the ability to tune unique locomotor subfunctions with distinct modulatory amplitude and that these tuning functions can sum when manipulating multiple pathways simultaneously. B, Theoretical motor functions X–Z are represented within receptors R1 and R2. For each function, the background has been colored if the receptor has the ability to tune this specific function. The intensity of the color represents the amplitude of the modulation. The modulation of functions X–Z with combinatorial interventions of receptors R1 and R2 obey to predictive tuning schemes (preservative, summative, and synergistic) that are shown in the frame R1 + R2. Our large-spectrum mapping confirms the prominent role of 5-HT1A receptors in facilitating locomotion (Antri et al., 2003; Courtine et al., 2009). We further demonstrate that 5-HT1A receptors markedly improved intralimb and interlimb coordination, the reproducibility of stepping, as well as flexion components. The activation of 5-HT7 receptors resulted in a similar gait tuning (Fig. 8A), but the extent of this modulation was lesser than expected (Liu et al., 2009). 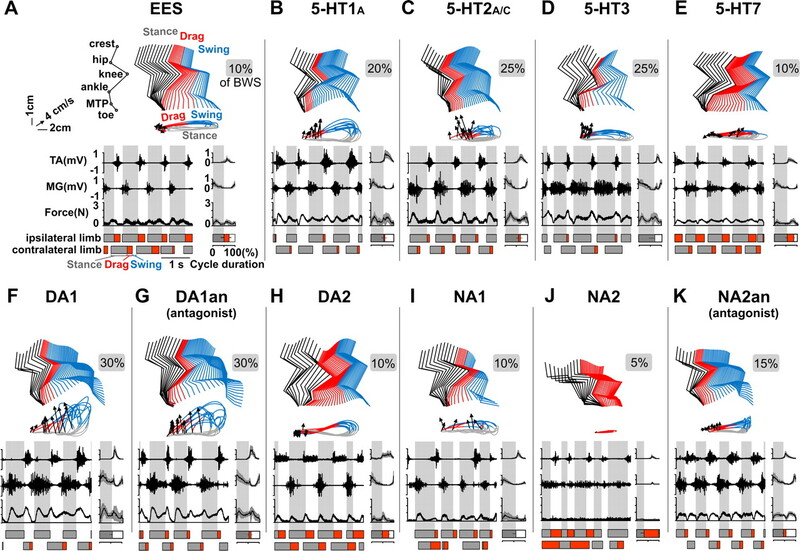 This general facilitation of rhythmicity, coordination, and flexion is consistent with in vitro electrophysiological studies (Liu and Jordan, 2005) and immunohistochemistry analyses (Noga et al., 2009) that demonstrated the preferential localization of locomotor-related 5-HT1A and 5-HT7 receptors in upper lumbar segments where it has been suggested that the primary circuitry to drive locomotor outputs is located (Kiehn, 2006), and which essentially contain flexor motoneurons. In turn, we found that the activation of 5-HT2A/C receptors strongly enhanced extension and weight-bearing capacities but had a modest influence on rhythmic components (Fig. 8A). This functional action of 5-HT2A/C receptors on gait patterns fits with their preferential influence on the properties of extensor motoneurons and on the layer of interneurons that shape motor output in lower lumbosacral segments (Okado et al., 1988; Liu and Jordan, 2005). However, Jordan et al. (2008) suggested that 5-HT2A-possessing cells exert limited direct influences on rhythm-generating components of the spinal locomotor system. Activation of 5-HT3 receptors resulted in a similar modulation of extension, with an additional specific influence on extensor burst duration (Fig. 8A). Although dorsally located 5-HT3 receptors essentially contribute to pain information processing, these receptors have also been found in high density in the ventral and intermediate gray matter of lumbar segments (Morales et al., 1998). This innervation pattern of spinal cord regions associated with motor processes explains their potent ability to modulate locomotion (Guertin and Steuer, 2005). Likewise, we found a powerful but rather unspecific facilitation of locomotor output with the activation of DA1 receptors (Fig. 8A). This tuning pattern reflects the widespread action of this dopaminergic pathway on the level of motoneuron excitability and the synaptic efficacy of ventral horn neurons (Han et al., 2007). However, our data suggest that the facilitation of stepping with the activation of DA1 receptors is not associated with a direct stimulation of the spinal interneuronal networks that form the core circuitry for locomotion (Lapointe et al., 2009). In contrast to in vivo studies in spinal mice (Lapointe et al., 2009) but in agreement with in vitro investigations on neonatal mouse preparation (Madriaga et al., 2004), we could detect reproducible modulation patterns associated with DA2-like receptors. This tuning was orthogonal to that associated with DA1-like receptors (Fig. 8A), suggesting that, as in many brain areas, DA1-like and DA2-like receptors play complementary functions in the modulation of spinal motor circuitries. Finally, in striking contrast with findings obtained in cats (Chau et al., 1998a; Delivet-Mongrain et al., 2008), we reveal that activation of α2 adrenergic receptors suppressed electrically enabled locomotion in spinal rats (Fig. 8A), whereas blocking this pathway systematically improved stepping consistency and extension (Fig. 8A). Descending noradrenergic fibers essentially modulate the transmission in spinal reflex pathways (Riddell et al., 1993). In particular, activation of α2 adrenergic receptors markedly depresses the excitability of polysynaptic reflex circuitries (Chau et al., 1998b), which play a determinant role in enabling locomotion with electrical stimulation (Lavrov et al., 2006, 2008). The modulation of these reflex pathways may thus account for the observed tuning of spinal locomotion with the activation and blocking of α2 adrenergic receptors. However, further studies are necessary to identify the underlying mechanisms and clarify the reasons for the differences between cats and rats on the function of noradrenergic receptors. Collectively, these results not only confirm previous findings with quantitative evaluations but also significantly expand current conceptual views by uncovering specific functions of monoaminergic receptors in the control of gait in vivo. To the best of our knowledge, our mapping establishes for the first time a comprehensive catalog of functional links between monoaminergic receptor systems and the modulation of defined features of a sophisticated behavior in mammals. We next sought to exploit our mapping to tailor pharmacological mixtures that could capitalize on receptor-specific functions to restore near-optimal locomotion in spinal rats (Fig. 8A). Specifically, we aimed to devise combinatorial interventions in a progressive and complementary manner based on the identified functions of monoaminergic receptors. For example, the activation of 5-HT1A and 5-HT7 promoted consistent locomotor movements with well defined flexion components but limited extension and weight-bearing capacities, as predicted based upon their individual tuning functions (Fig. 8A). We complemented their action with 5-HT2A/C receptor agonists that substantially increased forces and extension when administrated individually. 5-HT2A/C and 5-HT1A/7 influences summed near-algebraically when activating these receptors concurrently. Following this logic further, we could manipulate up to five serotonergic, dopaminergic, and noradrenergic pathways to restore full weight-bearing locomotion with partial equilibrium maintenance in spinal rats. In all these experimental conditions, the summation of receptor-specific tuning functions was striking and visually observable in the resulting gait patterns (Fig. 8A). Thus, contrary to combinatorial pharmacotherapies that aimed to activate putative central pattern-generating networks indistinctively (Barbeau and Rossignol, 1991; Antri et al., 2003; Lapointe and Guertin, 2008; Guertin et al., 2011), our system-level understanding of monoaminergic tuning functions provided the means of predicting optimal mixtures to achieve the complementary modulation of specific sensorimotor circuits in a way that progressively normalized locomotion of paralyzed rats toward that of healthy subjects. Using our detailed statistical analyses, we found that the concurrent manipulation of multiple monoaminergic receptors modulated the locomotor states following predictive tuning schemes, which we termed preservative, summative, and synergistic tuning. (1) Preservative tuning characterized the modulation of features specifically associated with a given monoaminergic receptor, which were preserved during combinatorial stimulations. (2) When there was a partial overlap between receptor-specific modulation patterns, their concurrent activation generally mediated a summative tuning of those features that were modulated by recruiting each receptor independently. (3) Finally, we found that manipulating multiple receptor systems simultaneously could promote synergistic tunings of locomotion. With combinatorial paradigms, certain parameters became consistently tuned, whereas the same features were not, or weakly, affected when stimulating each pathway independently (Fig. 8B). Together, these results are consistent with recent findings that showed the localization of 5-HT1A, 5-HT2A, and 5-HT7 receptors onto specific and common locomotor-activated neurons with distinct densities along the rostrocaudal extent of the lumbosacral spinal cord (Noga et al., 2009). Thus, these findings reinforce the viewpoint (Hochman et al., 2001; Grillner, 2006; Jordan et al., 2008; Courtine et al., 2009; Hägglund et al., 2010) that descending monoaminergic systems orchestrate the parallel modulation of a widely distributed and heterogeneous, but highly integrated and synergistic, system of circuits that can generate a range of specific gait patterns when recruited in different combinations (Fig. 8A). Serotonergic and dopaminergic pharmacotherapies have not been evaluated systematically in humans with spinal cord injury to date, although useful precursors and agonists are commercially available and approved for use in humans (Guertin et al., 2011). Based upon the strong synergy between monoamine pathways and the efficacy of spinal cord electrical stimulation to facilitate movement in humans (Carhart et al., 2004; Harkema et al., 2010), neurorehabilitative strategies combining combinatorial pharmacotherapies and neuroprosthetic electrode arrays constitute timely and innovative solutions to ameliorate sensorimotor functions in individuals with neuromotor disorders (Fong et al., 2009; Musienko et al., 2009). Supplemental material for this article (supplemental table reporting the computed parameter, supplemental movie) is available at http://www.neuroreha.uzh.ch/expneuroreha/research/Musienko2011.html. The supplemental movie shows the capacity to control distinct stepping behaviors through single as well as combined monoaminergic stimulations in rats with complete spinal cord transection. The video includes audio commentaries. This material has not been peer reviewed. This work was supported by the International Paraplegic Foundation P106, the National Center of Competence in Research “Neural Plasticity and Repair” of the Swiss National Science Foundation, University of Zurich, Russian Foundation for Basic Research Grant 08-04-00688, and NIH Grant 1R01 NS062009. We acknowledge the excellent technical help provided by Lucia Friedli, Janine Heutschi, and Nadia Dominici for data collection, data analysis, and care of the rats. (2000) Volume transmission as a key feature of information handling in the central nervous system possible new interpretative value of the Turing's B-type machine. Prog Brain Res 125:3–19. (2010) Understanding wiring and volume transmission. Brain Res Rev 64:137–159. (2003) 5-HT1A receptors are involved in short- and long-term processes responsible for 5-HT-induced locomotor function recovery in chronic spinal rat. Eur J Neurosci 18:1963–1972. (1991) Initiation and modulation of the locomotor pattern in the adult chronic spinal cat by noradrenergic, serotonergic and dopaminergic drugs. Brain Res 546:250–260. (2004) Epidural spinal-cord stimulation facilitates recovery of functional walking following incomplete spinal-cord injury. IEEE Trans Neural Syst Rehabil Eng 12:32–42. (1998a) Early locomotor training with clonidine in spinal cats. J Neurophysiol 79:392–409. (1998b) Effects of intrathecal alpha1- and alpha2-noradrenergic agonists and norepinephrine on locomotion in chronic spinal cats. J Neurophysiol 79:2941–2963. (2005) Performance of locomotion and foot grasping following a unilateral thoracic corticospinal tract lesion in monkeys (Macaca mulatta) Brain 128:2338–2358. (2008) Recovery of supraspinal control of stepping via indirect propriospinal relay connections after spinal cord injury. Nat Med 14:69–74. (2009) Transformation of nonfunctional spinal circuits into functional states after the loss of brain input. Nat Neurosci 12:1333–1342. (2008) Effects of localized intraspinal injections of a noradrenergic blocker on locomotion of high decerebrate cats. J Neurophysiol 100:907–921. (1995) Locomotor capacity of spinal cord in paraplegic patients. Ann Neurol 37:574–582. (2009) Recovery of control of posture and locomotion after a spinal cord injury: solutions staring us in the face. Prog Brain Res 175:393–418. (2007) Epidural spinal cord stimulation plus quipazine administration enable stepping in complete spinal adult rats. J Neurophysiol 98:2525–2536. (1979) On the central generation of locomotion in the low spinal cat. Exp Brain Res 34:241–261. (2009) Recovery of locomotor function with combinatory drug treatments designed to synergistically activate specific neuronal networks. Curr Med Chem 16:1366–1371. (2005) Ionotropic 5-HT3 receptor agonist-induced motor responses in the hindlimbs of paraplegic mice. J Neurophysiol 94:3397–3405. (2011) Effects on locomotion, muscle, bone, and blood induced by a combination therapy eliciting weight-bearing stepping in nonassisted spinal cord-transected mice. Neurorehabil Neural Repair 25:234–242. (2010) Activation of groups of excitatory neurons in the mammalian spinal cord or hindbrain evokes locomotion. Nat Neurosci 13:246–252. (2007) Dopaminergic modulation of spinal neuronal excitability. J Neurosci 27:13192–13204. (2010) Sensory control of standing and stepping enabled by epidural stimulation after a human motor complete spinal cord injury. Soc Neurosci Abstr 36:259–251. (2001) in Motor neurobiology of the spinal cord, 5-HT receptors and the neuromodulatory control of spinal cord function, ed Raton B (CRC, Boca Raton, FL), pp 47–87. (2008) Descending command systems for the initiation of locomotion in mammals. Brain Res Rev 57:183–191. (2006) Locomotor circuits in the mammalian spinal cord. Annu Rev Neurosci 29:279–306. (2006) Contribution of spinal 5-HT1A and 5-HT7 receptors to locomotor-like movement induced by 8-OH-DPAT in spinal cord-transected mice. Eur J Neurosci 24:535–546. (2008) Synergistic effects of D1/5 and 5-HT1A/7 receptor agonists on locomotor movement induction in complete spinal cord-transected mice. J Neurophysiol 100:160–168. (2009) Specific role of D1 receptors in spinal network activation and rhythmic movement induction in vertebrates. J Physiol 587:1499–1511. (2006) Plasticity of spinal cord reflexes after a complete transection in adult rats: relationship to stepping ability. J Neurophysiol 96:1699–1710. (2008) Epidural stimulation induced modulation of spinal locomotor networks in adult spinal rats. J Neurosci 28:6022–6029. (2005) Stimulation of the parapyramidal region of the neonatal rat brain stem produces locomotor-like activity involving spinal 5-HT7 and 5-HT2A receptors. J Neurophysiol 94:1392–1404. (2009) Spinal 5-HT7 receptors are critical for alternating activity during locomotion: in vitro neonatal and in vivo adult studies using 5-HT7 receptor knockout mice. J Neurophysiol 102:337–348. (2004) Modulation of locomotor activity by multiple 5-HT and dopaminergic receptor subtypes in the neonatal mouse spinal cord. J Neurophysiol 92:1566–1576. (1998) Distribution of neurons expressing immunoreactivity for the 5HT3 receptor subtype in the rat brain and spinal cord. J Comp Neurol 402:385–401. (2009) Combinatory electrical and pharmacological neuroprosthetic interfaces to regain motor function after spinal cord injury. IEEE Trans Biomed Eng 56:2707–2711. (2009) Locomotor-activated neurons of the cat. I. Serotonergic innervation and co-localization of 5-HT7, 5-HT2A, and 5-HT1A receptors in the thoraco-lumbar spinal cord. J Neurophysiol 102:1560–1576. (1988) Differential innervation of specific motor neuron pools by serotoninergic fibers in the chick spinal cord. Neurosci Lett 94:29–32. (2001) Multiplicity of mechanisms of serotonin receptor signal transduction. Pharmacol Ther 92:179–212. (1993) Depolarization of group II muscle afferents by stimuli applied in the locus coeruleus and raphe nuclei of the cat. J Physiol 461:723–741. (1995) The dopamine D1 receptor antagonist SCH 23390 can exert D1 agonist-like effects on rat nucleus accumbens neurons. Neurosci Lett 199:13–16. (1999) Volume transmission in the CNS and its relevance for neuropsychopharmacology. Trends Pharmacol Sci 20:142–150.